On March 21, chefs from around the world will work to create a French-style dinner for the Gout de France/Good France celebration. The event, now in its fifth edition, aims to promote French gastronomy to the world. Launched in 2015 by the French Ministry of Foreign Affairs and International Development, French Embassies all over the world organize the event in their respective residing nations. This year’s event has two major themes: sustainable dining and the Provence region of France. On Tuesday, Le Cordon Bleu-Sookmyung Academy held a traditional French dinner, inviting local high school students in cooking. After visiting the institute’s cooking studio, the students sat down to a traditional French dinner. The institute prepared the event in hopes of more students experiencing the art of French gastronomy. French Ambassador to Korea Fabien Penone was in attendance. Celebrating Gout de France/Good France, the French Embassy in Korea will hold a dinner on March 22, inviting two chefs from the Provence region. 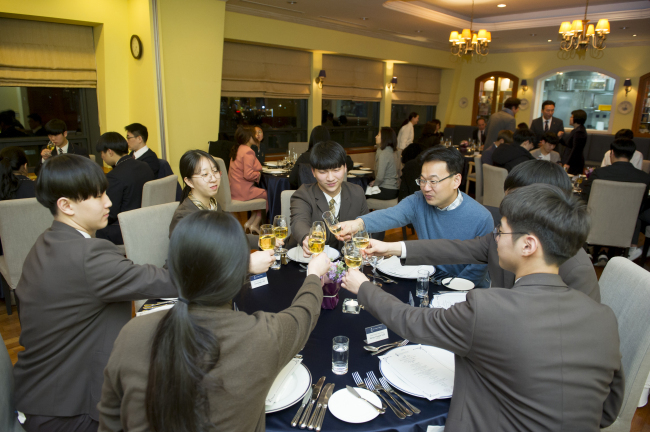 Thirty-one French restaurants in Korea are set to celebrate the occasion.